Porsche is looking forward to the official launch of the 2015 911 GT3 RS, likely after stuffing car writers with so much wine and shrimp that they think going automatic-only makes sense. Screw that. Here's how the car looks in the raw, unfiltered wild. Well, unfiltered might be the wrong word. These photos were posted on Instagram, after all. 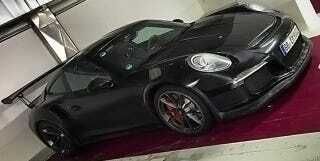 The user is Stuttgart resident Johan9ff, who should know a thing or two about fast Porsches. We've seen this car disguised and in model car form. The only thing left to understand is if those side radiators are for turbo intercoolers. If that's the case, shouldn't this thing be a GT2 RS? And if this isn't a turbo GT2 RS, then how nuts is that model going to look?